“Drinking the Kool-Aid”: It’s a phrase probably said every hour of every day in the United States, and the flippancy sometimes makes us forget about the dark origins behind the words, in a mass suicide in the jungles of South America at a place known as Jonestown. In November 1978, Americans could not escape the photos of the dead and the charismatic Indiana preacher who led them. Much has been written over the years about Jim Jones and the People?s Temple, by survivors, academic researchers, and even conspiracy theorists. 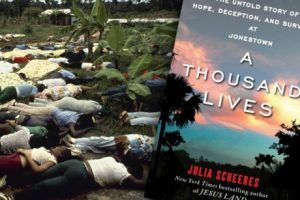 A recent book by Julia Scheeres, whose own time of terror at the hands of religious extremists in the Caribbean is documented in Jesus Land, brings to life the history of Jones and the People’s Temple, from its very first days. What A Thousand Lives adds to the conversation is new information gleaned from tens of thousands of recently released documents that had been collected by the FBI in the wake of the massacre. This wealth of material includes the personal journal of a Jonestown resident, audio tapes of the Jones’ sermons (including his nearly 24-7 rantings over the community’s PA system), invoices for materials shipped to the colony, false confessions church members were forced to sign to keep them from defecting, hundreds of letters to Jonestown residents from concerned family members that were never delivered, and notes from the community physician (who never completed his residency) on the most effective method for killing large numbers of people. This information broadens and provides a depth to the portrait of the People’s Temple that has not been seen before. A few issues struck me reading this book. First was how starkly it demonstrated just how dangerous the mixing of church and state can be. One of the reasons that Jones got away with abuse, fraud, etc., for decades was the fact that the church had friends in high places in government, in the United States and Guyana. Jones himself was chair of the San Francisco Housing Authority for a time, named to the position by Mayor Moscone, whom he helped elect. In Guyana, he fostered relationships with government officials that often involving bribes and insiders placed specifically to gather information about which way the wind was blowing as regards to the People’s Temple. Also, Jones was at the forefront of “faith-based initiatives” from the time the group moved from the Midwest to California, when he encouraged members to open up group homes to house the folks being tossed out of mental institutions by then-Governor Reagan (with all of the government money going to the church, of course). The People?s Temple also cared for foster children (some of whom ended up dead in 1978), fed the homeless, helped addicts overcome. Not only did the People?s Temple receive government funds for doing so, but because of the perception that the group did so much good, news articles and reports from defectors about beatings, financial malfeasance, Jones’ drug use, etc., were discounted by authorities up until the very end. And ironically, the CIA was too worried about violating the church’s First Amendment rights to investigate repeated reports from those who escaped the church that a mass suicide was being planned . . . reports that came years before the actual event. And that is one of the other things that the newly released documents make crystal clear: The people who died at Jonestown, for the most part, had been trapped by Jim Jones and those at the top of the People?s Temple over years and in some cases decades. Parents were separated from their children and forced to sign false confessions of abuse and other crimes to keep them compliant; spouses and other family members were likewise separated. Others were threatened with the revocation of parole if they left the church. Passports and other documents as well as cash were taken upon entry in Guyana, held for “safekeeping.” Jones’ sons helped fake raids on the compound to justify their father’s teachings about external apocalypse and the possibility of a raid. And at the end, there were guns in addition to the cyanide punch. Much of what Jones and the People’s Temple leadership did in those final years was designed to move members, even those who tried to extricate themselves from Jones’ influence, toward those final moments in Guyana. And this fact makes the many lost opportunities to shut Jones down even more distressing. A Thousand Lives: The Untold Story of Hope, Deception, and Survival at Jonestown by Julia Scheeres was published in 2011 by Free Press, 320 pages, available in paperback and Ebook editions. Real family values in the 21st century!